One of the real challenges of trying to reproduce Viking food is that we can’t actually know exactly what they ate because they didn’t write it down. What we do have to go on is the archeological record, and some very sketchy literary evidence from the sagas. What that leaves us with is “Viking possible”. Something that they could have eaten based on the ingredients available and they equipment they had to cook with. 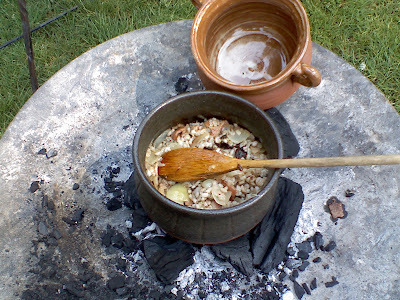 In the pot is one of my favorite Viking possible recipes: grain (barley, oats) with apples, bacon and onions. I think this example actually has prunes instead of the apples which is also very good. Fry the bacon and onions, add the grain and fruit, plus water to cover, and simmer until the grain is done. If you use stone ground or steel cut oats, it cooks quite quickly, and makes a hearty meal any time of day. I’ll be posting more “Viking possible” recipes as time goes by. Hi, interesting to read about your experiments, actually doing the same this summer logging my experiments on this blog http://eldrimner.wordpress.com/. About this possability, what kind of apples did you use? Seems nice and like a good combination, but I would be a bit cautious about frying things…since I would assume that most of the frying pans found would have been used for bread rather than frying of meat and onions. I think in this particular batch I used commercial dried apples. I’ve also used fresh ones, mostly just store-bought pink ladies or fujis. There is a big heirloom apple festival in October, and I should try this with some crab apples or lady apples, something old. 🙂 On the frying, I just put some butter in the bottom of that pottery vessel that’s in the picture and heated it up over the coals, then sauteed the onions and apples before adding the grain and liquid. I was wondering where you were getting your pottery. I’ve been having a hard time finding things that can be used in an open fire or over coals other then Cast Iron. Do you have a link for a Merchant? I get almost all my pottery from either Mistress Morgaina (Jeanne Wood, http://jeannewoodpottery.com/) or Mistress Gwen (http://dragonfirepottery.com/). They both do reproduction medieval and earlier period potter that is designed to go over or on the fire. They both produce truly excellent quality work at very reasonable prices.